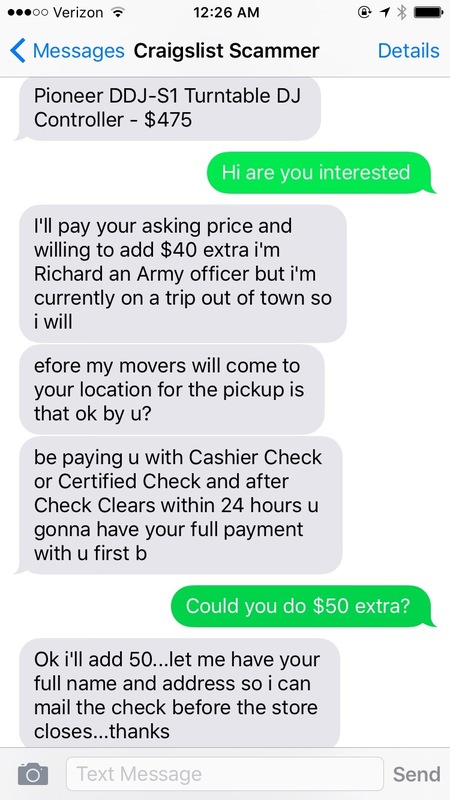 I use Craigslist all the time – usually it’s painless and I meet with the buyer in person and complete the transaction, but other times I get weird text messages from strangers who want to send me extra money to cover “shippers fees” or other ridiculous charges that you wouldn’t normally have to worry about. 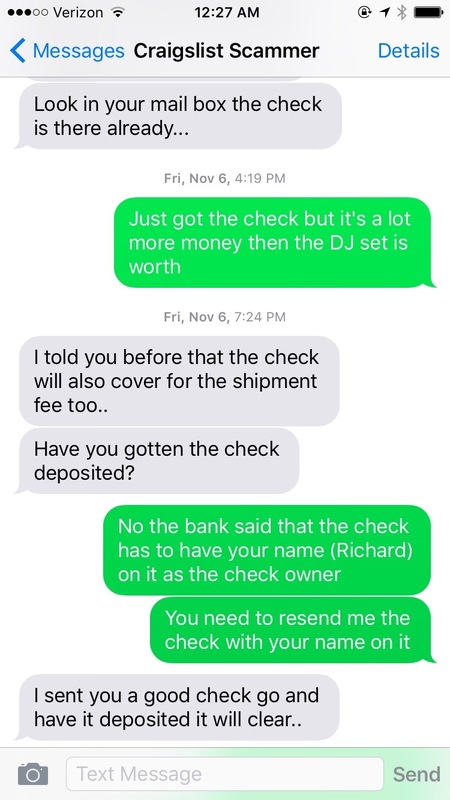 I ran into one of these scammers a few weeks ago when I was trying to sell a DJ Turntable, so I went along with it to see what would happen and I documented the whole process below to show people what really happens when scammers try to trick you on Craigslist. To most people, falling for something like this can be avoided due to the “too good to be true” principle, but for people who don’t use Criagslist that often or are generally too trusting of other people, consider this a guide to avoiding this type of scam in the future. Note: Scams like this are illegal, although it is very unlikely the perpetrators will ever be caught because they usually originate overseas. These scams are usually violating multiple laws including Forgery, Mail + Wire Fraud, and Check Fraud, which is a felony in most states. Before you read this story, you should keep in mind that any person who tries to use a cashiers check is usually scamming you, even if the check looks legit. You should never accept a cashiers check from someone on Craigslist. I’m going to re-word that: You should never accept anything other than cash on Craigslist. The Craigslist scam starts off simple enough. With a text message that mentions the item and a introduction. So immediately off the bat your BS alarm should be going off because the person doesn’t even ask if the item is available, he is probably using a web script to go through each Craigslist listing and scrape the title of the post, then message the owner of the item in hopes of a response. Most people will ignore messages like this, but because I want to mess with him, I’ll follow along and even ask for $50 more on top of the original price. Of course he will give it to me. He asks for my shipping address, and I gladly provide (You should never do this. By the way. But for the sake of the story I provided a fake name and an apartment address without a specific apartment number. Better safe than sorry.) By now you should realize the weird formatting of his messages, cutting off words at random places. That is because he’s probably using a free online VoIP phone like Google Voice, because the phone number he is using is easily replaceable and can be changed incase his number becomes associated with scams. The tracking number is real. It does track the package. 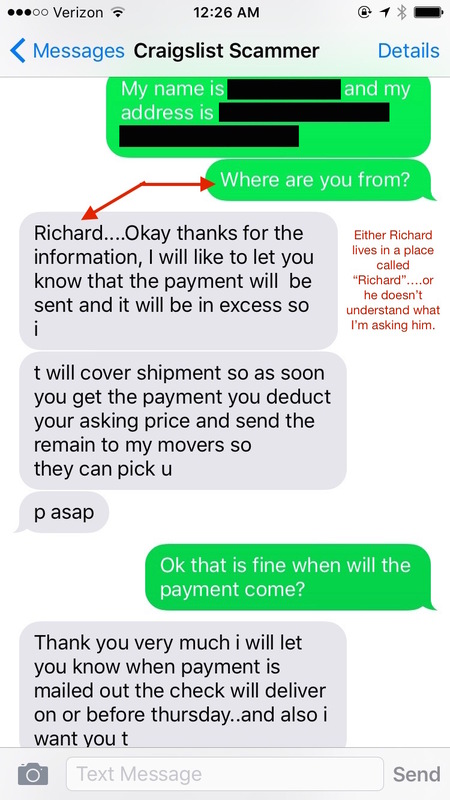 Richard asks me to take down the listing (probably because he doesn’t want to make a fool of himself and accidentally scrape the result again and message me asking the the same thing). Of course, I don’t take it down. Because I need to still sell it. Lo and behold – a few days after Richard sends the message with the tracking number, the package arrives. 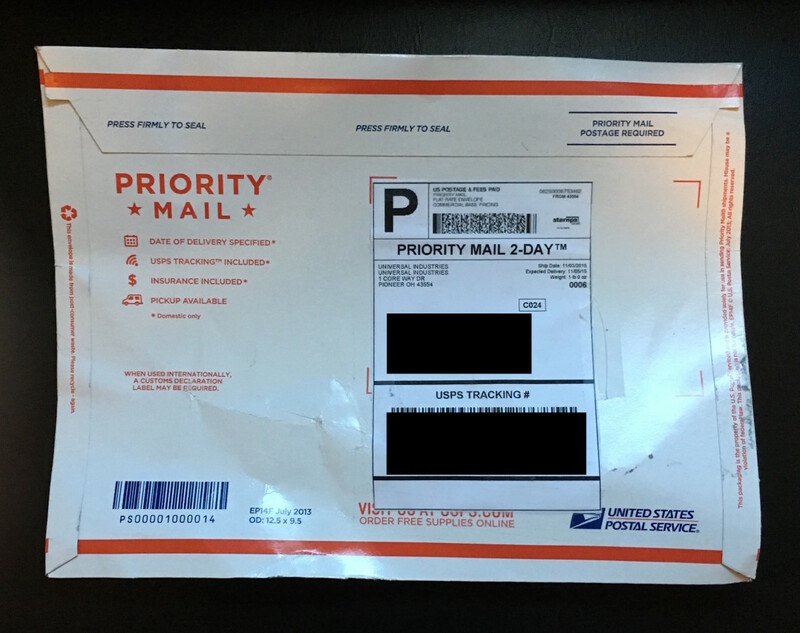 The “From” address is real and it looks like a company that was probably used at random, but it’s not located in the same ZIP code that the package was sent from. At this point our buddy Richard has spent at least $5.25 to ship me the flat rate envelope. I sleep well at night knowing that I cause the scammer to part with his $5. This is the check that was inside. The remitter and signature are different. The document does not have microprinting, and screams low quality. It also feels like regular printer paper but it does have the serrated edges that you usually find on checks, so at least it has that going for it. At this point in time what people who have fallen for the scam do is take this to their bank and deposit it. The bank usually will not have a problem with it at all, the money will be available in your bank within the next few days, and you will send “Richard” the item that he paid for as well as the extra shipping money. 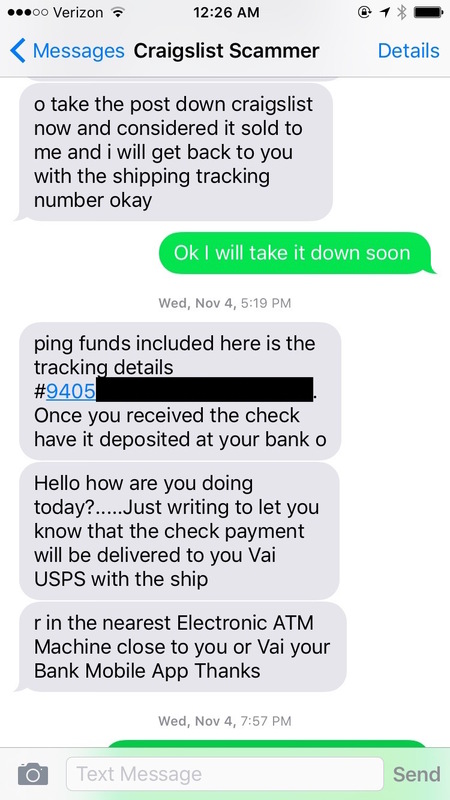 About two weeks later you’ll get a message from the bank stating that the check you deposited was fraudulent, and now YOU are responsible for paying back the amount that you spent on Richards shipping agent, as well as anything else. 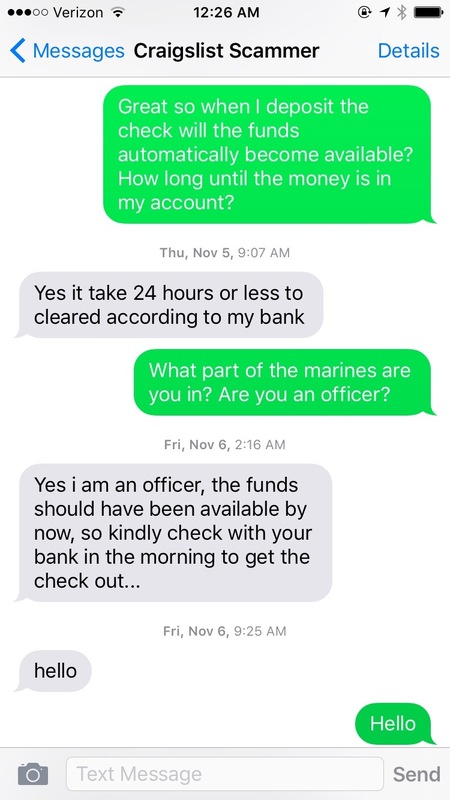 Notice, also, how Richard now is in the Marines, where earlier he said he was Army. The result of these scams is that the fraudulent check will be returned unpaid. The bank will then deduct the amount of the check from your account or otherwise seek repayment from you, and you will lose either the goods that you sold, the money that you sent to the third party, or both. Scams, generally–Federal Trade Commission (FTC):by telephone at 1-877-FTC-HELP or file an electronic complaint via their Internet site at http://www.ftc.gov. Internet-based scams–Federal Bureau of Investigation (FBI) Internet Fraud Complaint Center: http://www.ic3.gov. 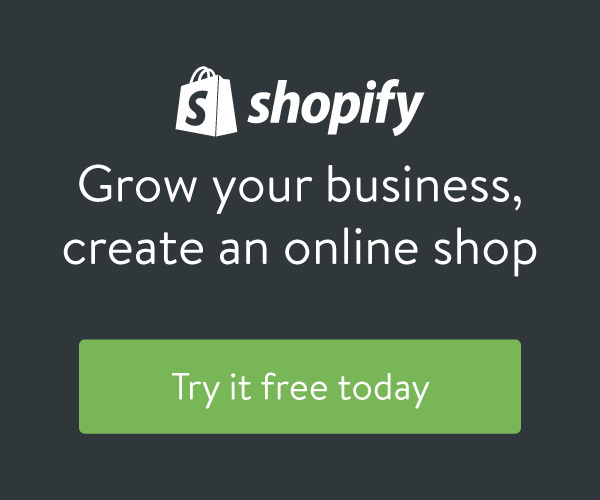 Mail-based scams–U.S. Postal Inspector Service:by telephone at 1-888-877-7644, by mail at U.S. Postal Inspection Service, Office of Inspector General, Operations Support Group, 222 S. Riverside Plaza, Suite 1250, Chicago, IL60606-6100 or via e-mail at https://postalinspectors.uspis.gov/forms/MailFraudComplaint.aspx. At this point in the story I took the check to the bank and reported it as fraud, but nothing will probably ever happen because, again, the scammer is likely overseas. I messed with Richard one last time just to see if he would send me another check, but I think he realized that he’d been duped and I was just trying to inconvenience him. 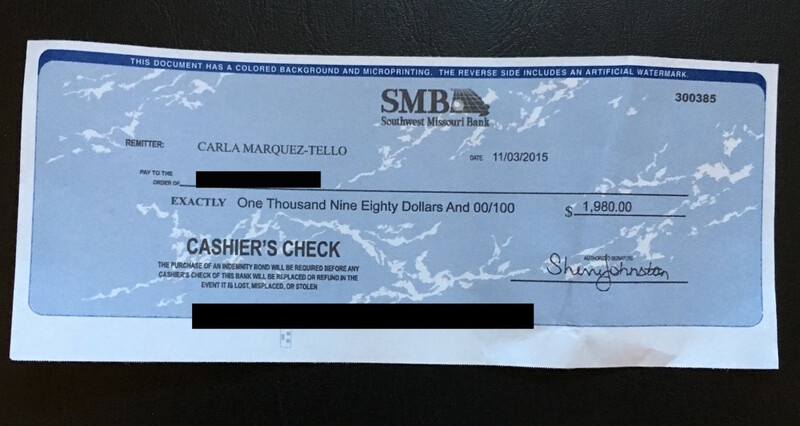 Never, ever, accept a cashiers check from someone on Craigslist! There have been a few people emailing me asking what to do if they already gave the scammer their phone number/address/personal info. To be completely honest, you are most likely fine. The scammer has probably had this happen to them 100’s of times, so even though your info is out there, it’s very unlikely that they will try to do anything with it.